Emmaus College offers an enriching and nurturing environment for our Middle House students. It actively supports our young students throughout their early secondary school years providing them with opportunities to confidently journey throughout their time at the College. The extensive academic program allows our Middle House students to experience the versatility of learning. Middle House at Emmaus College uses the vertical system of Pastoral Care. Each student who enters Emmaus College at Year 7 and Year 8 level will work under the guidance of their House Leader and their Pastoral Leader. The pastoral group comprising of Year 7 and 8 students will remain with their Pastoral Leader for two years. This leadership allows for solid foundations to be set and developing positive relationships and support throughout the Middle House years. Our Transition Program enables House Leaders to work with the Transition Co ordinator in implementing strategies which will ensure a smooth introduction into secondary school. Emmaus College understands that Year 7 will be a challenging year for our new students to the College especially when faced with a completely new and unfamiliar environment. Under the supervision of many dedicated teachers, the annual camp to Rawson in the first weeks of the school year allows our students to extend friendships with students from other Houses. It is during this camp that the House spirit is developed, friendships forged and continued through their school years. Our Peer Support Program connects our Year 10 students with Year 7s, acting as mentors, whilst introducing them to life and community at Emmaus College. 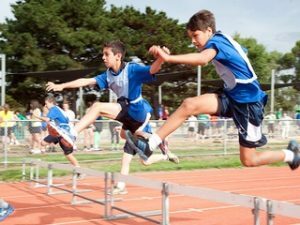 The participation in EISM sports allows our Middle House students to display their skills and talents in various sport whilst competing with other Catholic and Independent schools within the eastern region. Buddy activities implemented once every term sees our Middle House and Senior House students come together and participate in a structured program of activities. This connection reinforces and consolidates the community and House spirit at the College. Middle House sets the foundation for an optimistic learning experience throughout a student’s academic life at Emmaus College. The senior years at Emmaus College present students with many challenges as they move into a more focused and rigorous approach to their study. For many, Year 10 is the beginning of their VCE as they take up a Unit One area of study in a preferred subject. The teachers at the senior level are aware of the significant shift in engagement that students need to make to stay abreast of their studies and are there to guide and mentor all students in this transition. Our House based vertical pastoral care structure encourages a sense of belonging to one’s House without losing a sense of identity within the Emmaus community as a whole. The House based Year 12 Retreat at the beginning of the school year presents students and their pastoral teachers with a wonderful opportunity to get to know each other, share their stories and enter into a spiritual focus in a trusted environment. Emmaus Day and sports carnivals provide a venue for healthy rivalry between the houses with students, guided by School and House Captains and members of the SRC, energetically embracing the competitive nature of these events. The senior years offer students the opportunities to engage in optional travel opportunities to Tasmania, Europe and Central Australia and the possibility of exchange programs to Indonesia, Italy and Germany to enhance their language skills. Senior students are encouraged to apply for the many leadership positions that are available at Emmaus. They can nominate for membership on the many committees – Liturgy, Arts, Academic and Social Justice, or School Captain, Vice –Captain or the four House Captain positions. All positions serve to strengthen a student’s organizational, communication and people skills in readiness for life outside their formal, secondary school years. Senior students also come together each year to attend the many occasions on the social calendar. There is the Year 10 Social and the Year 12 Formal held each year, organized by a student committee and overseen by House Leaders. They are always much anticipated and a great success. The Year 11 students take part in the Debutante Ball each year and enter into this very formal occasion with enthusiasm and maturity. It provides a unique rite of passage for those who take part; one of many that they will experience in life. 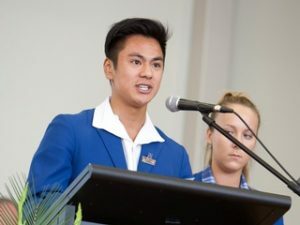 The senior years at Emmaus College provide a nurturing yet challenging environment in which all students have the opportunity to develop into focused, caring and mature young men and women.